Baking your own bread gives you the chance to add only the ingredients you want. This is particularly useful if you happen to have an allergy to certain ingredients, such as gluten and is great if you happen to be on a low-salt diet. Making bread from scratch can be time consuming, but having a bread maker lets you get on with other things while it does the work for you. This top-loading machine has a viewing window in the lid, allowing you to look at the item you are baking. It is made for use in the US and Canada. 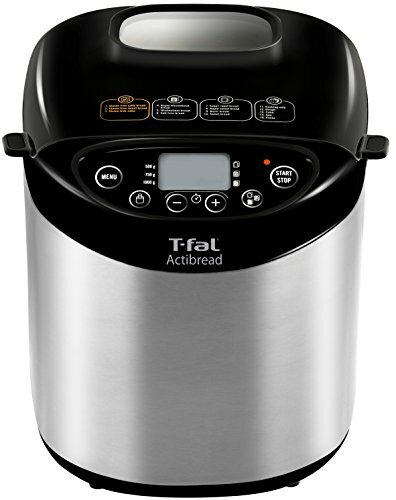 The T-fal ActiBread lets you cook loaves in a choice of three sizes: 1 pound, 1.5 pounds, and 2 pounds. You can also select from three different crust settings: dark, medium and light. There are 15 programmable settings for various types of bread. In addition, it has dedicated programs for pasta dough, pizza dough and jam. The program numbers for each setting are displayed on the lid. Bread baking settings include French, salt-free, and “super rapid.” There are two gluten-free options, for savory or sweet. Whole wheat and rapid whole wheat bread are also catered for. It will bake a gluten-free cake, other cakes, and doughs. If you like your bread to be kept warm it has a one-hour, keep-warm function. There is also a 15-hour delayed start built into the programs for this appliance. A clear LCD display shows your choice of the size of loaf being cooked and its crust type. It also displays the program number and has a timer. The bread pan and kneading blade have a coating that is non-stick, making removal of the loaf, and also cleaning the appliance, a breeze. The bread pan has a handle to facilitate removal from the machine after cooking. The appliance is supplied with a measuring cup and spoon, plus a bread-removal hook. With 25 recipes, the recipe book includes gluten-free options. It also has a limited warranty of one year. Should You Buy the T-fal ActiBread Bread Maker? I love the gluten free and healthy diet options this bread maker offers. It will bake wholemeal and salt-free bread, which are perfect if you have dietary restrictions. The keep-warm feature is a big plus, so you can ensure your bread is ready just when you want to serve it. The programs are easy to set and there is an alarm function which sounds when it’s time to add ingredients like nuts, honey or dried fruits. The finished product is impressive, with a crusty exterior and a light, soft center. Once baking has finished and the product has been removed, the bread pan and kneading tool are easy to clean. The sleek and stylish appearance appeals to many friends, who have also found a home for it on their kitchen countertop. The viewing window lets you see how your bread or cakes are progressing at each stage. The ability to make jam is a bonus that we all appreciate. It turns out really well and is the perfect topping for the new baked bread. On the downside, the machine can be a little noisy, although it doesn’t move around on the countertop when in use. The lack of a dispenser for additives means you have to wait around to add them at the correct time in the process. Some users have found the instructions and recipes provided with the machine are not the best. I admit, you do have to experiment at first, in order to get the perfect loaf of bread for your taste. Recipes found online might work better for you. The T-fal ActiBread bread maker is both stylish and of good quality. The many settings and programs make it a versatile addition to any kitchen. Gluten-free and salt-free settings will meet the requirements of various dietary challenges. Whole-wheat bread can also be made, with or without salt, for a healthier alternative to white bread. This machine will produce the bread and cakes you love whenever you want them. The additional functions of making doughs and jams add to the value this appliance provides. No more trips to the bakery or grocery store for freshly-baked bread and cakes. Just pop the ingredients in, set the program and wait for the enticing waft of fresh bread to permeate your home. Even the jam can be made at home, to make the perfect topping. Newer PostWhat's the Best Wine for Cheese Fondue?